House horrors, part two: rebuilding the monster. Three weeks ago we started a “small” home repair project. When you start a project like this, you don’t really know what you’re getting into until you actually start getting into it. Well, it became much more of a project than originally envisioned. If you want to know why I haven’t done a lot of blogging recently, this is almost entirely the reason: we wound up replacing everything about the original porch except the two upright posts, and those we altered. 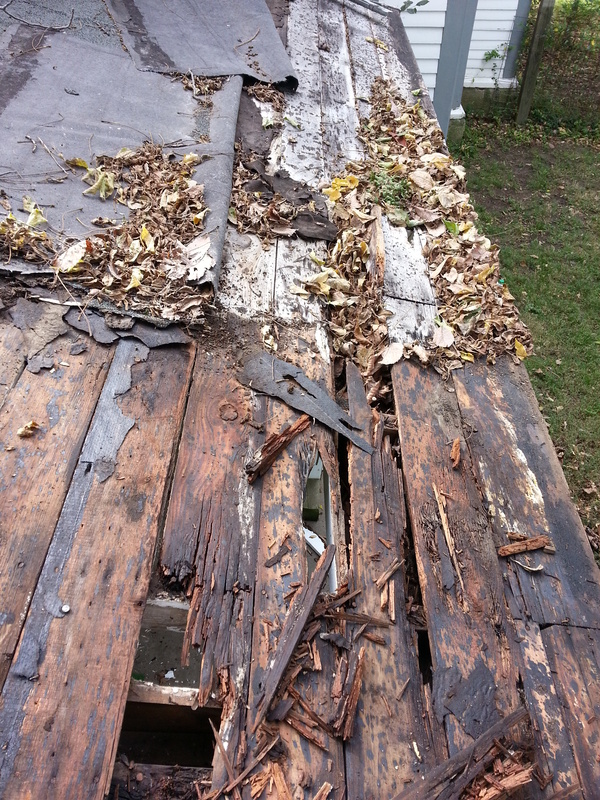 We even wound up having to clean up and put aright some of the work which had originally been done to tie in the porch roof to the house roof, which was a real horror. And when I say that “we” did it, I mean that literally: my wife and I. We actually did every single aspect of the work. 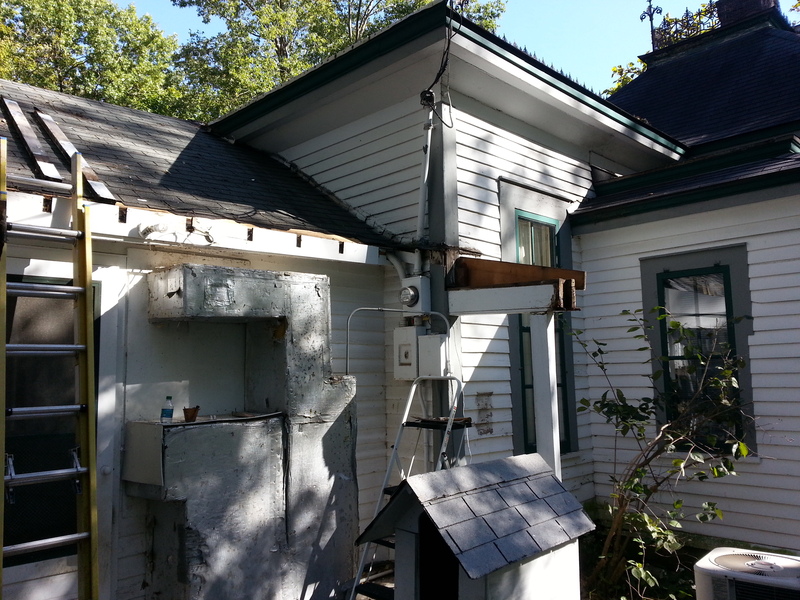 My wife is an architect, and we’re both very used to working on smallish practical repairs — the sort of thing you always have pending on a house which is 130+ years old. Had we known that this job was going to turn out being so big, we might have opted to put it off until a contractor we trust was able to work it into his schedule. But once we got started, we were committed to doing the work all the way through, not according to someone else’s schedule. So, we did it. What follows below is a step by step photo documentation of the work, just for grins. We finished the work this weekend (well, except for the painting, but that’s pretty minor and will get done in a week or so when we have a chance), and I’m really pleased with how well it all turned out. So, if you’re interested, take a look. And with a little luck this week I’ll get back to a more normal posting schedule. *Sorry, couldn’t resist. Check the Wikipedia link about St Teilo above. Sound Sculpture Ahead. Move to outer left lane, maintain speed of 70 kph. He pulled the little GM rental hybrid into the left lane carefully, and thought about setting the cruise control, but was unsure where to find it on the unfamiliar vehicle. The car crossed the first warning rumble strips. Darnell turned his attention to the sound of the tires, and a few moments later was treated to a long, drawn-out rumble over a series of carefully spaced and specially shaped strips, which distinctly said: “WWWWW-ELLL-CCCCOOOOOMMME-TOOOOO-WWWWWAAAALLLESSSS”. Sounds emanating from 1,300 feet of roadway just west of Tijeras have been listened to around the world, and it’s more than just tires on pavement catching international attention. The Singing Road, installed last week, uses rumble strips to play “America the Beautiful” for drivers who obey the speed limit as they cruise down Route 66. The National Geographic Channel approached the New Mexico Department of Transportation about the project last June, asking if they could construct the road for an upcoming series. The project was privately funded by National Geographic and NMDOT didn’t make – or spend – any money on it. Since the road was finished last week, Melissa Dosher, the public information officer for NMDOT, said she’s fielded questions from television stations as far away as Australia. There’s a video (with sound) at the above site, so you can hear it. Fun stuff. HT to ML for the initial link last week. House horrors, part one: the uncovering. We live in a “Notable Historic Structure“: the house built by the first dean of the University of Missouri Medical School back in 1883. As with almost any structure this old, it’s seen a lot of alterations and additions over the years, complicating the history and the condition of the house. It’s quite literally the case that there are layers and layers of changes you uncover when you do any work on the place. About a decade ago we had the house professionally painted by someone who specializes in doing work on historic buildings, and the painter estimated that he removed about 35 layers of paint — it was about a half inch thick. So whenever we have to do any work on the place, you expect to find … surprises. For major projects we’ll call in a crew of professional. But for smaller jobs, my wife and I will tackle it on our own. Since she’s an architect with a lot of practical construction experience, and I’m good working with tools, this usually works pretty well. Usually. 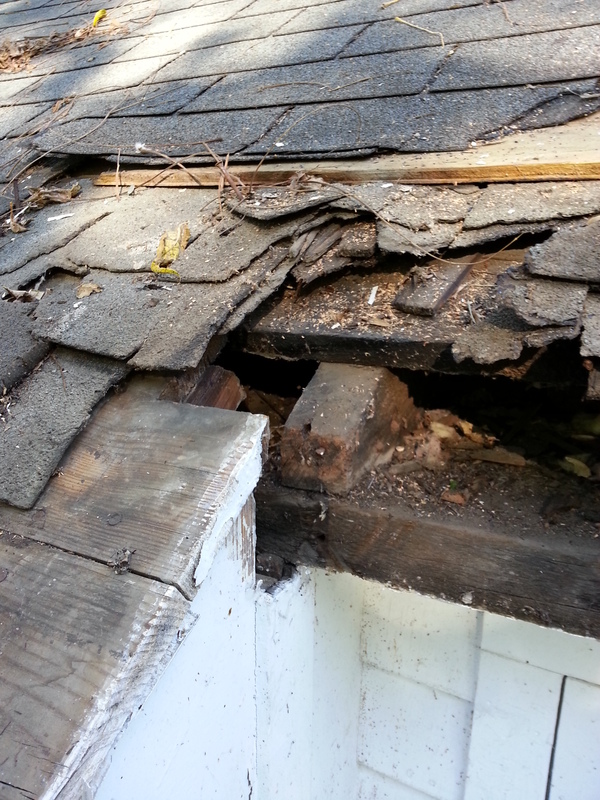 Seeing that, we planned on doing some substantial roof repairs the next time we could set aside a couple of days for it. Which turned out to be this week (hence the fall leaves in the pic above). When you start a project like this, you don’t really know what you’re getting into until you actually start getting into it. 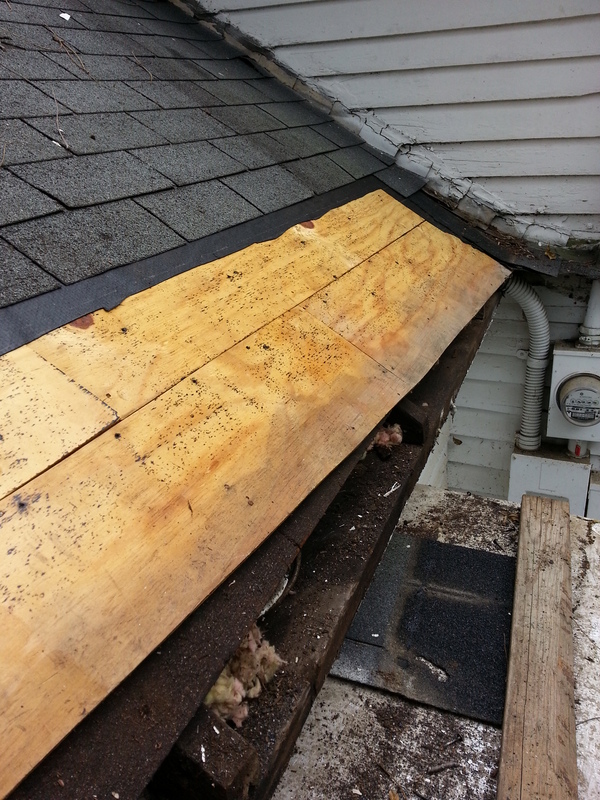 So we got up there and stripped off the rest of the flat roofing materials, and expected to have to replace some of the original sheathing board. 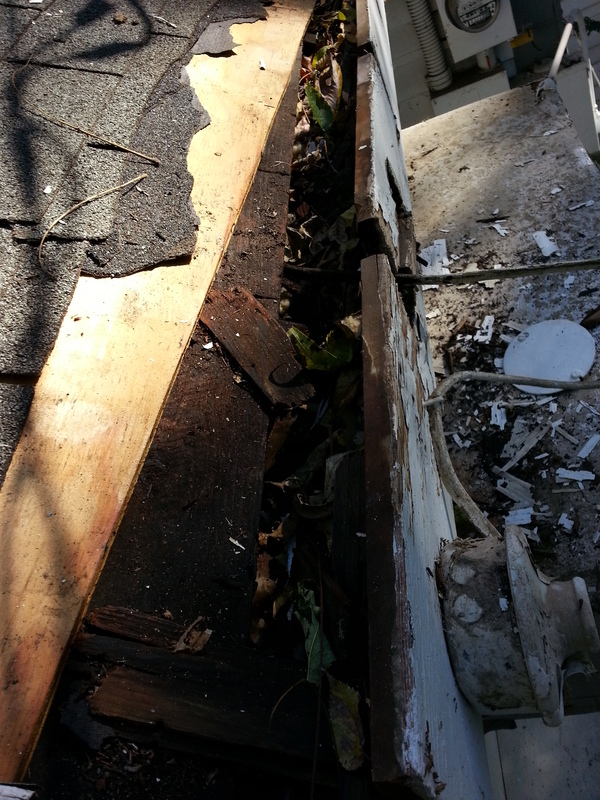 But after close examination, we decided that it made more sense to just replace the entire deck surface — it looked like the deck boards had probably been scavenged from some older building when they were originally put up, and all of them were in pretty poor condition. What had been done was that they just added the 1″ wide fascia on top of the original fascia, with notches cut into the new fascia to help support the rafters. 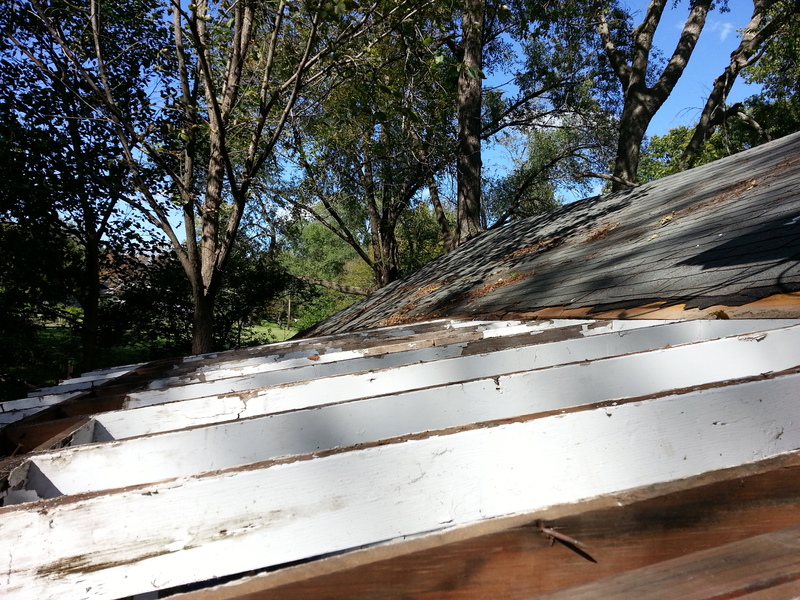 Oh, and some of the rafter ends were cut at an angle and then just nailed RIGHT ON TOP of the old house roof. Yeah, they didn’t clear it off, or anything. 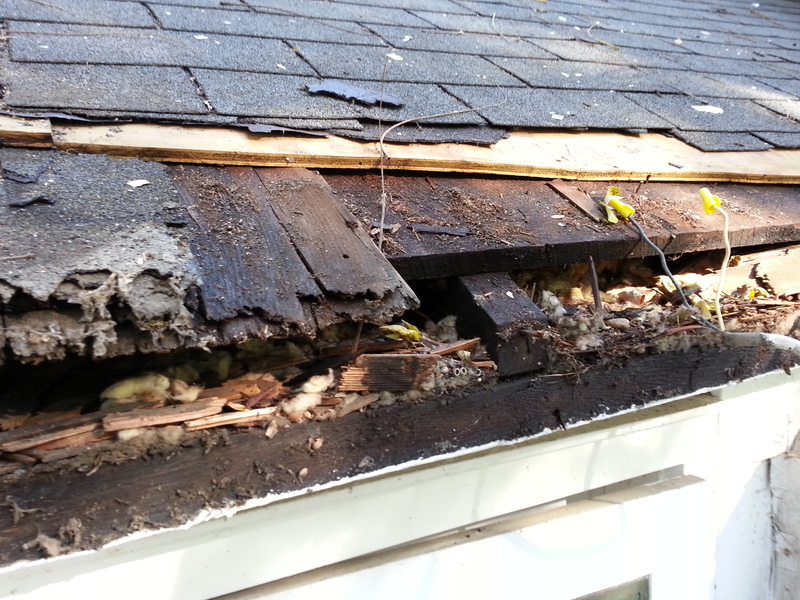 In fact, if you look closely, you can see that someone had just put down plywood sheathing over the old roof of cedar shakes and asphalt shingles. 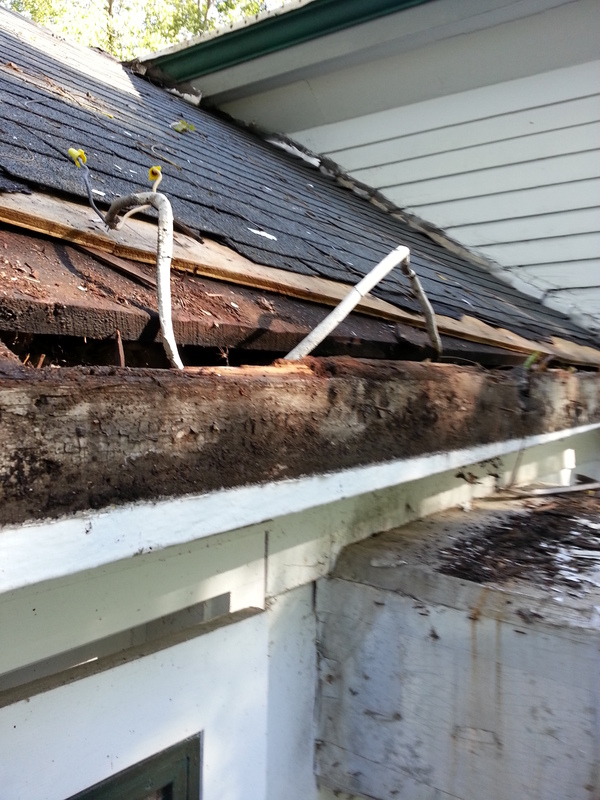 The horror, the horror … That’s more of the original roof material just covered over by plywood. Sheesh. Getting to this point was two days of work. We had allotted three days to do the entire porch repair, including time to assess the true nature of the work and get the needed materials for completion. That was because the weather forecast was for heavy storms to start late on the third day. There was no way we were going to be able to get the whole thing finished. And I’m *very* happy to report that the temporary work has handled the storms so far just as intended. When we get good (enough) weather again, we’ll take off the side beams and replace everything with new lumber, properly constructed. 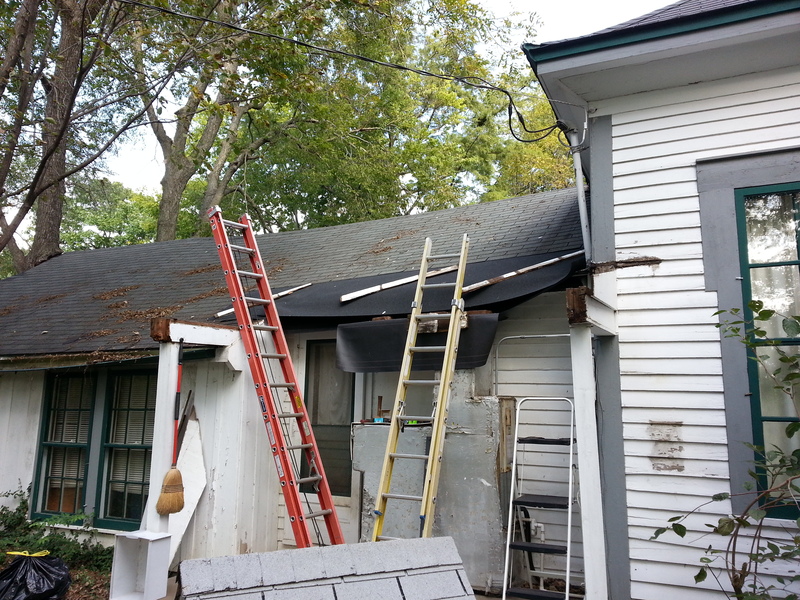 With all the old crap roof stuff out of the way we’ll be able to attach the porch roof much more securely and have a better seal/transition of the roofs as well. A NASA-backed study explores an innovative way to dramatically cut the cost of a human expedition to Mars — put the crew in stasis. The deep sleep, called torpor, would reduce astronauts’ metabolic functions with existing medical procedures. Torpor also can occur naturally in cases of hypothermia. Economically, the payoff looks impressive. Crews can live inside smaller ships with fewer amenities like galleys, exercise gear and of course water, food and clothing. One design includes a spinning habitat to provide a low-gravity environment to help offset bone and muscle loss. *Obviously. Hat tip to ML for the link. He continued on. Along a tumble-down wall separating fields, partially overgrown with hedge and briar. Past cattle in the field, grazing and occasionally lowing to one another, who took little interest in him as he walked along. Through another kissing gate, and almost suddenly he was standing there before the structure, bare to the sky. One great slab of stone several meters long and a couple wide, supported by three menhir, high enough that he would have to stretch a bit to touch the underside of the capstone. There were a couple of additional uprights at the south end, and several largish stones which had tumbled over. He just stood there for a moment, taking it all in. An ancient structure synonymous with the Pembrokeshire countryside has been recreated using the latest CGI technology. Cadw, the Welsh Government’s historic environment service, has digitally restored the Pentre Ifan burial chamber in the latest of a series of videos available on its YouTube channel. Fun to see that interpretation of it. 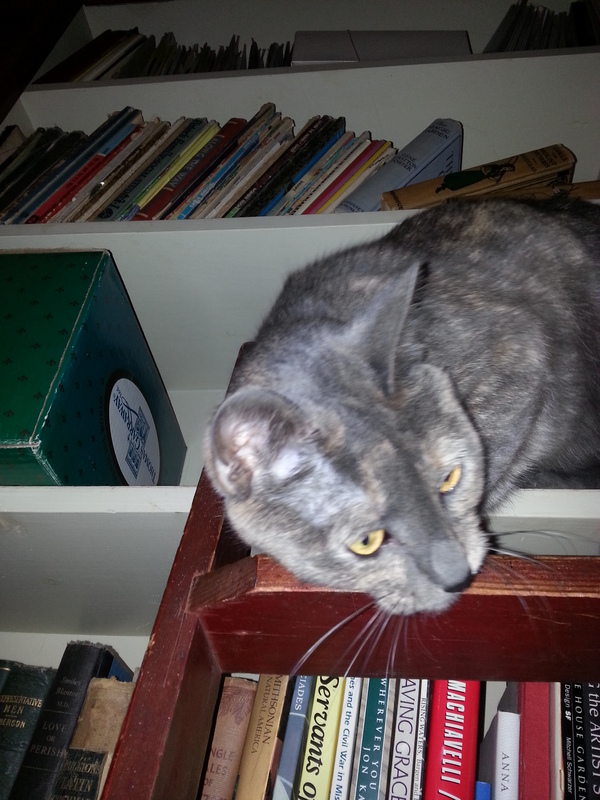 She’s named after Sir Edmund, because when she was young she always wanted to climb things. She’s no longer a youngster, and just turned 14. For the most part, she’s been in good health, though in the last year she started losing her eyesight, and just recently she’s had some minor strokes. The results of this are that she’ll just get confused for a while, sometimes tend to walk in small tight circles, and occasionally throw up. But our vet says that she’s not in any real pain, and as long as she continues to bounce back from those episodes, there’s no reason why we can’t keep her and love her with a little extra care. We’re used to caring for people and pets which need a little additional attention, so it’s no big deal. As you can see, she also likes climbing on things. But she’s named ‘Melyn’ for the color of her eyes. It’s Welsh. Yeah, as you might gather from St Cybi’s Well, we enjoy Wales, and my wife has been learning the language for a decade or more. Mel’s about 4 years old, and a bit more of a rascal. The two cats get along tolerably well. Our bed is on top of a stack of drawers. One of Mel’s favorite games is to pull open those drawers. And in particular, the one which is right where my foot needs to go when I swing my leg out of bed. This is especially fun when it’s the middle of the night and I’m just getting up to go to have a pee (ah, the joys of middle age … ). I’ve cracked the side of my bare ankle on the side of that drawer too many times to count. But even *I* will learn eventually, so I’ve gotten into the habit of swinging my leg out even further, and then sweeping it in slowly so as to push the drawer closed if it has been left open by dear Mel. Sometime last night, Hil seems to have had another minor stroke. And after getting down from the bed, threw up. Fortunately, she did so on a small throw rug (hmmm … ). It woke my wife up, so she dealt with it, and then took Hil in to where the litter box is, thence to the water bowl in the bathroom. Since Hil was a little confused, and my wife wanted to get back to sleep rather than sit and watch the cat while she decided whether or not to have some water, she just left Hil there. This is fairly normal — give Hil a reference point, and she’ll manage to sort out where she wants to go eventually. Usually, by the time I get up in the morning (I get up first), Hilary has made her way downstairs and is politely waiting for breakfast. Mel is more … demanding. And serves as a very effective wake-up clock if I try and sleep in. As the saying goes, there’s no snooze button on a hungry cat. So this morning we went through the usual routine. I got up, swung my leg over, closed the drawer, and put on some clothes. My wife told me that Hillary had had an episode earlier, but that she had dealt with it. Mel noisily demanded breakfast. So I went downstairs, Mel close at heel the whole way. Got the catfood out, took it to where their feed bowls are. Mel dug in, but Hil wasn’t to be seen. I checked around, didn’t see her downstairs, but figured that since she had been sick in the night, she might not be hungry and was probably curled up somewhere in the upstairs, would come down when she felt like it. No biggie — I could check on her later if she didn’t appear. I got coffee, and went about my wake-up routine. Normally this includes getting in a walk, but today we have heavy thunderstorms and I am not THAT dedicated to getting in my exercise. Same for my wife, who thought she’d just catch a little extra sleep after her disrupted night. After an hour or so of coffee and reading online, including a lot of attention from Mel but no sign of Hil, I figured I’d pop upstairs, see if I could find Hillary, and see how she was doing and whether she wanted some food yet. I went upstairs. My wife was waking up, doing a little reading in bed. She said she hadn’t seen Hil yet this morning. I checked around upstairs in all her usual haunts. No luck. Yeah, you guessed it. I thought to check the drawer below our bed, which I had closed without looking earlier. There she was, happily snoozing in amongst the clothing. I brought her downstairs, got her some food. Mel watched, yellow eyes glinting. And I think I detected a slight smile on her face, as well. A postscript: Hillary had another and much larger stroke about 12 hours after I posted this. 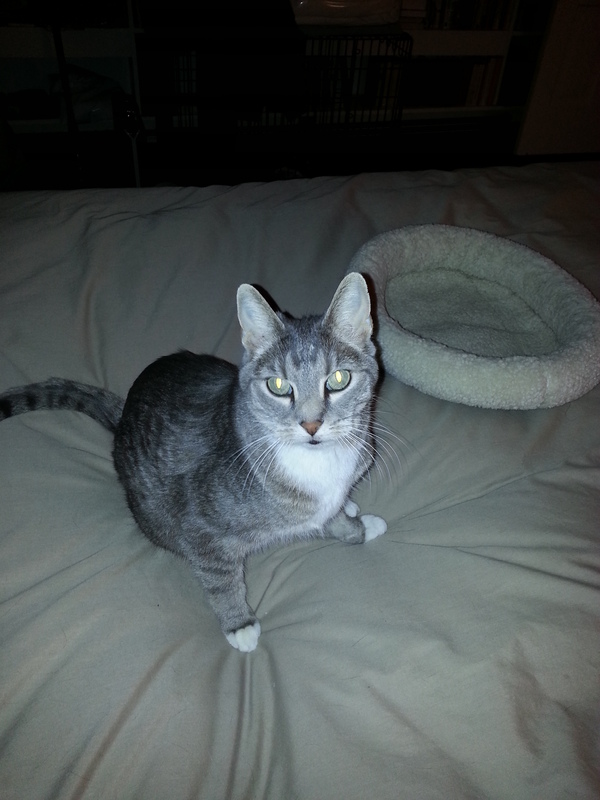 She passed away peacefully in the early hours of the next morning.